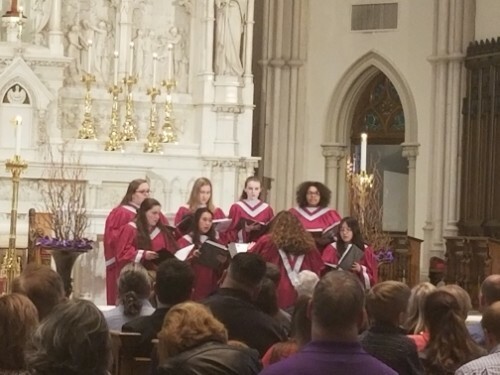 On Saturday, March 30, eight students from OC participated in the American Federation's Pueri Cantores Festival at Saint Paul Cathedral: Riley Bankovic, '21, Bella Enfield, '19, Eithne Hartnett, '19, Maddy Mustin, '19, Monica Veres, '19, Amy Wang, '19, Dalila Weismantle, '21, and Michaela Weismantle, '22. The festival featured 11 schools from Western Pennsylvania and Ohio. The guest conductor, Paul French, is the Director of Music at Our Lady of Mount Carmel Church in Chicago, Illinois and is the President and on the Board of Directors for the American Federation Pueri Cantores. Don Fellows, organist at Saint Paul Cathedral served as the organist for this fantastic event. Students arrived at noon and rehearsed all afternoon for the special Mass at 6pm that evening. One of only two groups selected to perform a solo prelude prior to Mass, Oakland Catholic's performers inspired attendees with their beautiful voices. On top of experiencing a spiritually-uplifting day, they enjoyed meeting other talented students from all over the region. Thank you to Mrs. Sonya Caceres for preparing our OC singers for a fabulous performance.